Formula designed for daily supplementation. 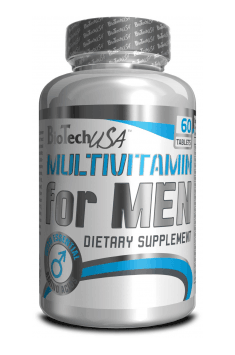 Men who follow a balanced and varied diet, which is a source of many vitamins and minerals, may take one tablet daily. However, factors such as increased physical activity, consumption of highly processed food and frequent exposure to stress may lead to hormonal imbalance and vitamin and mineral deficiencies. It is then suggested to take a higher dose – 2-3 tablets daily. Since the product contains substances which are soluble in water as well as fats, it is suggested to take the supplement during a meal. Silicon, right behind oxygen, is the second richest element in nature and the third the most abundantly occurring trace element in the organism. Despite such frequent occurrence of silicon in nature, its health properties are very often ignored. Precise, biochemical or physiological functions of silicon are unfortunately unknown, however, the interest in potential pro-health effects of this element is increasing. It was noted in literature that this element may have influence on the proper structure of nails, hair and skin, the synthesis of collagen, bone mineralization, strengthening of the vascular system and it may be engaged in the efficiency of the immune system. When it comes to skin, the ability of silicon to activate hydroxyl enzymes and optimize the synthesis of collagen is very important, which consequently positively influences firmness and elasticity of skin and supports would healing. The benefits resulting from the increased content of silicon in hair are i.a. reduction of hair loss and the improvement of its gloss. You will find in our offer silicon i.a. in the form of stabilized silicic acid which is considered active and one of the best assimilable forms. Supplementation with this element is recommended especially to people who are dealing with osteoarticular problems. It will also work well in case of skin problems, excessive hair loss and weak nails.